The twentieth anniversary of the Fall of the Berlin Wall presented a unique opportunity to examine global developments since then – including the rise and fall of unipolarism – and to consider the strategic, ideological and economic implications of the emerging multipolar world.  The 10th Summit considered how the ideological, economic, strategic and religious walls that continue to divide humanity might best be dismantled and replaced with bridges of communication and understanding. The Summit’s agenda included the following topics: 20 Years after the Fall of the Berlin Wall: what were its implications and what has changed since then? : in an historic debate, Nobel Peace Laureates as Mikhail Gorbachev, Lech Walesa, F.W. De Klerk and others were invited to discuss the meaning of the fall of the wall twenty years after the event and the implications of the new emerging multipolar world. Breaking down walls created by nuclear weapons of mass destruction: i.e. the walls of strategic military advantage that continue to divide mankind. Breaking down walls between cultural, religious and ethnic communities and the ways and means of building bridges between such communities: nearly all conflict in the world today is caused by continuing walls between ethnic, language and religious communities within the same societies, as well as by the walls of religious fundamentalism that continue to divide the world. Breaking down the walls that prevent progress toward sustainable development: The walls of short – term economic interest and governmental and public apathy will have to be dismantled if mankind is to succeed in building bridges to an environmentally sustainable future. Breaking down walls between the development and developing world: i.e. the walls that continue to divide developed and developing countries and the bridges that can be constructed to ensure that all mankind will increasingly share in the benefits of the globalizing world economy. 11.00 – 13.00 First session: 20 Years after the fall of the Berlin Wall: what were its implications and what has changed since then? 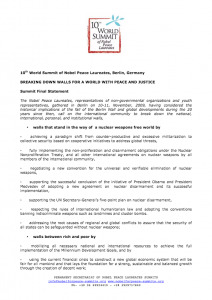 09.30 – 11.00 Fourth session: Walls of Nuclear Weapons and Armament: building up a world free from nuclear weapons and weapons of mass destruction. 11.00 – 12.30 Fifth session: Walls of Intolerance: breaking down walls between cultural, religious and ethnic communities. The Peace Summit Award 2009 was awarded to Annie Lennox during the 10th Summit of Nobel Peace Laureates, in Berlin on 11 November for her engagement in the fight against the HIV pandemic in South Africa. Annie Lennox’s SING campaign started to raise funds and awareness and to bring about support and change. The money raised by SING helps prevent the spread of HIV in South Africa, and also supports those currently living with HIV. The awareness it raises is just as valuable: education is a powerful tool.